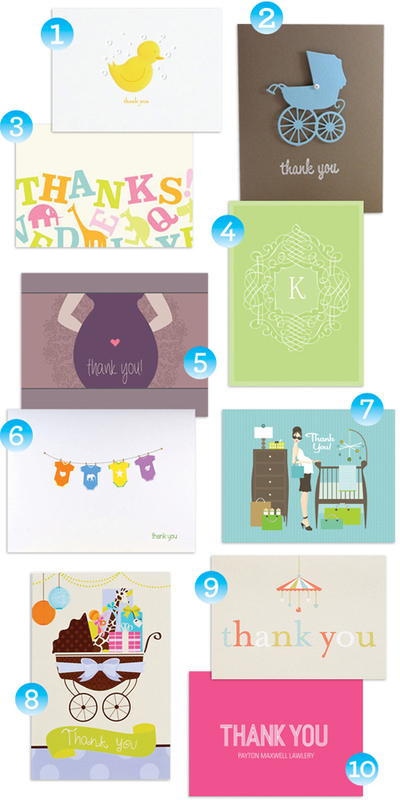 Confession: My baby shower was a month ago, and I still haven’t mailed out my thank-you notes. My mother has dropped subtle hints that I need to hurry up, but I’m justifying my procrastination with the fact that the Internet says I have any amount of time from “as soon as possible” to “better late than never” to finish. I think thank-you notes are important — I really do. In this age of e-greeting, e-viting and e-RSVPing, little folded notes of gratitude are one of the few paper pleasures we can still look forward to finding among piles of junkmail. It’s just hard to sit your round self down and actually write them — let alone address them, stamp them and send them. Trust me, I know. Now if you’ll please excuse me, I’d better get back to my note-writing. Mollee and her husband, Matt, live in Midlothian, Virginia, and are eagerly awaiting the arrival of their first baby (a girl!) in May 2013 any minute now. (Check out her baby guessing game here.) Although she helps pay the bills by doing graphic design, Mollee’s true passion is for making things with her hands. Find more of her recipes, paintings and crafts at molleemade.com. I love it, I also have the animal alphabet thank you cards #3! I find if I don’t write my thank yous within 24 hours I completely forget about them, which is bad. Good luck writing yours!